This book is a fictional story about a truly amazing man, who was my friend. As a child and a young teenager he would tell me stories and mysterious tales of far off lands and people. Singing strange songs in mysterious languages. At the time, I had not heard of the word enigma, but now I know my friend Louis was exactly that. Louis never lied to me. Only telling me what he wanted me to know, but somehow always managing to slide around a part of a story that would have possibly necessitated at least a white lie. At around eleven years old, I clearly remember asking him with a child’s innocence if he had ever killed anyone. He replied that the subject of death should never be discussed with people who did not drink brandy. At thirteen, I tried my first brandy and Louis laughed and laughed as I choked and spluttered on my first very small mouthful. It tasted vile, and burnt my lips, tongue mouth and throat. Not one to give in easily, I tried again some weeks later, finding that very small sips rolled around my mouth until enough saliva developed to be able to swallow helped. I still choked from time to time and Louis laughed roundly every time. He never did answer my question directly, but he did show me his 1929 Smith & Wesson .38 though. With his ivory handled horsetail flapping from side to side to keep the flies at bay, Louis and I passed many, many afternoons together. For a young innocent country boy, he was my only route to the wonders of the world outside my little country town. He taught me how to imagine. It is now almost forty years since my dear friend died and the right time to tell his story from the corridors of my imagination, so Louis, or Robbie as we all knew him, is not forgotten. 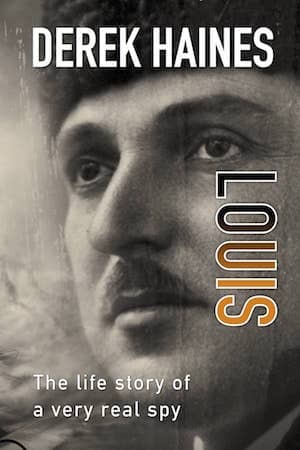 During the countless hours I spent researching Louis’ life, and delving into the memories of those who knew him, his extraordinary life became even more fascinating for me, as so little was, or is known about him. Only a few photographs remain of Louis, with precious little documentation and only the reminiscences of those few people still alive who knew him. While there are tales of his connection with the Palestinian Police Force in both Palestine and Kenya with secret meetings in Nairobi, while he was posted in South Africa, there are also mentions of his birth being in Egypt, Britain and even Romania. The only certainty about my friend Louis is that no one, not even those closest to him, knew his life story. His wife, Maria, passed away in 2012 at ninety-nine years old, and with her passing, the last of her husband’s secrets have been made safe forever. Louis died when I was seventeen, and my only wish now is that I had asked him more questions. But then again, perhaps it’s better this way. He was a hero to me, and still is – no matter the facts, truths or certainty. I hope you enjoy reading this story of my friend, Louis Robinson. “Louis” is un-put-down-able. It is a more realistic version of James Bond. The protagonist is someone that it is impossible not to care about. Louis could have penned Green Day’s “I Walk Alone”. The ending was surprising. I enjoyed the way the author managed to bring to life a story of a man who lived his life in constant danger and without friends but still managed to keep his moral base intact, despite all of it. I was glad someone was able to tell his story before he eventually passes on and it can now be shared in a thoughtful and provoking manner. There is sadness and emotion couple with adventure and spirit, all captured through the eyes of a man who lived anything but a normal life and documented by some skilful writing. Instead of a Bond-like adventure in which the hero gets in a shedload of trouble, gets the girl, kills the baddies and fights another day, Louis takes on a MI6 operative’s entire life, starting with youth as a Cairo orphan through pre-WWII Europe and post-War Palestine. Gripping and swift reading all around. I’d have liked to know more about the secondary characters, and perhaps have seen a page or two from one of those black notebooks, but all-around good stuff. This novel definitely held my interest. Lots of twists and turns. Filled with interesting characters. Reading this book was time well spent.